Meangadh Fíbín’s ‘Saol Faoi Shráid’ will air Monday 27th October on TG4, Kilkenny animator lands ‘South Park’ job, ‘Coda’ wins Best Animated short at the Chicago Film Festival and Brown Bag Films get two BAFTA Children’s Award nominations. ‘Saol Faoi Shráid’ (26 x 12’) is a new and original Irish language puppet series produced by Meangadh Fíbín and will air on TG4 from Monday 27th October. The series is aimed at three to six year olds and follows the adventures of brother and sister duo, Ribín & Glibín, aliens from the centre of the earth. When their space ship crashes, they find themselves in a new underground world where they find a new home with a group of insect characters and find out all that they can about this new world that they now inhabit and they learn a lot from their young Irish friends above the street. Producer of the series Mícheál Ó Domhnaill said: ‘Saol Faoi Shráid’ is a beautiful series and it was a pleasure to work on it. This series reflects TG4s commitment to producing indigenous content for its Young People’s schedule and we know that ‘Saol Faoi Shráid’ won’t disappoint its’ viewers’. ‘Saol Faoi Shráid’ was produced by Mícheál Ó Domhnaill and Darach Ó Tuairisg, written by Patricia Forde and directed by Deirdre Ní Fhlatharta. The songs for each episode were composed by Simon Noble. 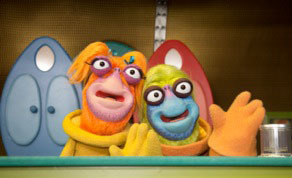 The cast of puppeteers include Ethel Burke (Ribín), Seán T. Ó Meallaigh (Glibín), Gráinne Bleasdale (Cicí), Ray Cuddihy (Rocco) and John Currivan (Dris). The show received support from the BAI Sound and Vision scheme and from the Section 481 incentives for film and TV drama put in place by the Irish Government. ‘Saol Faoi Shráid’ will air Mondays and Wednesdays at 9am with repeat broadcasts on Tuesdays and Thursdays at 3.45pm. It will also be available on TG4 Player. Kilkenny animator David O’Reilly has been hired as part of the writing staff of US animated series ‘South Park’. ‘I was introduced to Matt Stone by a mutual friend’, O’Reilly told The Examiner. ‘We got along and a month later I was in the writers’ room. It’s a huge honour as Matt and Trey are heroes. I’ve been watching the show since I was 12’. O'Reilly's previous work includes inserts for films, and an episode of the Cartoon Network series ‘Adventure Time’. ‘Coda’, a short Irish animation funded by the Irish Film Board, RTÉ and the Arts Council, has continued its festival success by winning the Silver Hugo prize at the Chicago Film Festival for Best Animated Short Film. ‘Coda’ has screened at over fifty international film festivals and has won over ten awards, including a win at the Edinburgh Film Festival. The nine minute long hand-drawn animation is directed by Alan Holly and is voiced by Brian Gleeson and by Orla Fitzgerald. As IFTN reported earlier this week, Brown Bag Films is celebrating two BAFTA Children’s Award nominations for their work on 3D animated series’ ‘Bing’ and ‘Doc McStuffins’. The announcement was made on October 21, 2014 by The British Academy Children’s Awards. ‘Bing’, a co-production with Acamar Films and Tandem Films which celebrates the reality of being a pre-schooler from Bing’s point of view, is nominated in the Pre-school Animation category. ‘Doc McStuffins’, about a six-year-old girl who heals stuffed animals and toys in her backyard clinic, is nominated in the International category. Norton Virgien, Director of ‘Doc McStuffins’ at Brown Bag Films said: ‘We are delighted to be nominated! Here in our Dublin studio we make sure that the heartfelt ‘Doc’ stories are translated into 3D with lots of energy, humour and sensitivity. The BAFTA nomination is a great recognition from the industry and it means a lot to us’. As IFTN reported earlier this week, Irish animated series ‘Roy’ has also received two animations at the Children’s BAFTA’s.